Dream Pod 9: New Infantry and Motorized Infantry Squad Packs. With the new edition rules a typical infantry squad is now represented by 6 to 8 Infantry minis on a 40mm round base an infantry team still uses a hex base. A motorized infantry squad is now represented by 3 minis on a 40mm round base. Our older infantry platoon blisters still include the hex bases, not the round bases, so we have started have started updating our Infantry blisters. Two squads and 1 Team blisters are already available for the North, South, Peace River and NuCoal and now we are adding the following infantry options for various factions. - New Southern Infantry of Jackrabbit Bikes Two Squads Pack (previously the Jackrabbit bike was only available with the sidecar) (6 Bikes and 2 round bases). - Southern Infantry of Jackrabbit Bikes with Sidecar Two Squads Pack (6 Bikes with sidecars and 2 round bases). - Northern Infantry of Wallaby ATVs Two Squads Pack (6 ATVs and 2 round bases). - CEF GREL Infantry on Hoverbikes Two Squads Pack (6 Hoverbikes and 2 round bases). - CEF GREL Infantry Two Squads and 1 Team Pack (16 Infantry, 2 round bases and 1 hex base). - CEF FLAIL Infantry Squad Pack (3 Flails and 1 round base). - Black Talon Infantry Two Squads Pack (14 Infantry and 2 round bases). - Caprice Infantry Two Squads Pack (14 Infantry and 2 round bases). We'll give the other platoon packs the same treatment in the coming weeks. For those interested here is a link to the Dream Pod 9 Online Store. 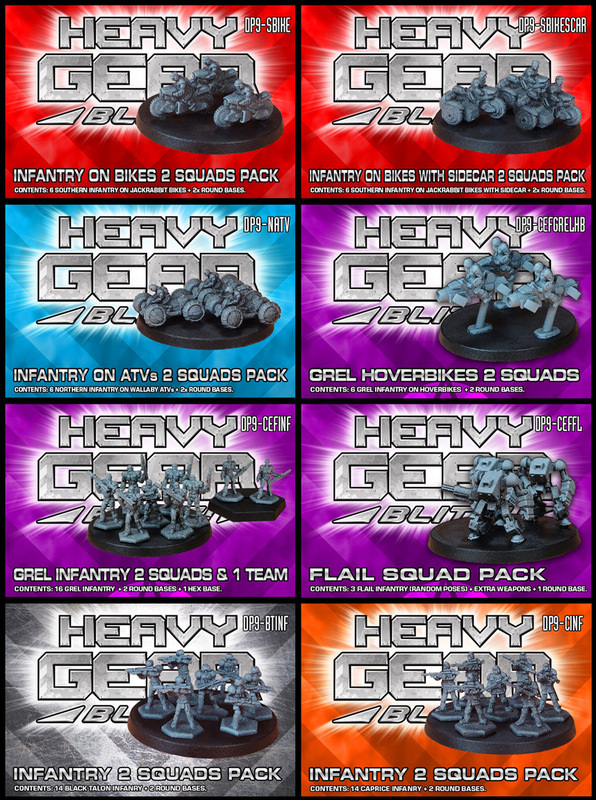 Home › Blogs › Robert Dubois's blog › New Infantry and Motorized Infantry Squad Packs.